Ya better say yer prayers ya flea-bitten varmint! I'm a-gonna blow ya to smithereenies! Above is the proper quote from Yosemite Sam as we know him from the famous Warner Brothers cartoons. Below, the pirate has transmitted what sounds like a data burst, followed by part of the quote, "Varmint, I'm a-gonna blow ya to smithereenies!". The transmissions were heard for some time, until amateur radio operaotrs tracked the signals to a government contractors' installation in the desert, at which time they abruptly stopped. 12/22/2004 19:41 Maybe the spook.gummint.mil is running a propagation test. 12/22/2004 21:11 110 degrees from central Az would put the signal into Mexico or on the border of SE Arizona not area 51 which is in Nevada. However, that said, Ft Huachuca home of Inscom and various other Army communications labs and test facilities, that would be the most likely source. Unless one has a pretty sophisticated DF system, it would be difficult to pinpoint even a near location. The best we could do with our systems which were enhanced with the Navy system was to an elipse of maybe 25 x 75 miles which still leaves a lot of territory. To get it closer would require some sort of mobile systems. The FCC df system at Douglas, if still in operation, might be too close and would be a lot of bounce due to the nearby mountains. The possibility of a propagation study for various ranges is a distinct possibility. I used to be on the mailing list for propagation information from one of the labs there. 1/15/2005 02:22 on 5 mhz under WWV using the Icom's autonotch filter on LSB. The strange thing is Sam's message is truncated, it's now just the data burst followed by the single word, "Varmint". Also, it appears in a staggered, random-seeming pattern, once, maybe twice a minute, sometimes at :05 past the minute, sometimes at :20 past. Buzz with VARMINT at 08, 28, and 48 seconds after the minute. Gee, it's easy to correctly find the right time now. :-) WWV is S7 and Sam is not as loud as WWV. Easy to hear at 08 and 48, but 28 is difficult to hear over the WWV tone. Im in Lincoln Nebraska. Time: all day, but right now its 2142Z. 1/15/2005 15:41 I remember when we first heard it here on 3700 on Dec 17 we thought it was saying Herman also, but since proved it was Varmint. This is the same, though to me the buzz at the beginning sounds different somehow. 1/15/2005 22:11 Y. Sam on 5 MHz this evening. Here in Idaho WWV is really strong but once in awhile I catch a "grrrrrr...varmint!" Nothing on the other frequencies so far. 01/16/05 0420Z hearing WWV, HD2IOA Guayaquil, Ecuador, and only hearing Yosemite with the grrrr and the word varmint... YS is S8, Ecuador is S7, and WWV is underneath all of them. 0120 18 Jan 2005 5.000 Mhz, random transmissions during "quiet" period of WWV broadcast "[buzz] Varmint!" The "data" can be heard a bit better a few KHz down, it's is better copy at 4995 that at 5000. Side note, can also copy the russian time signal on 4995. Been ages since I had heard it. 3/6/2005 16:45 "Amateur Radio NewslineT Report 1438 - March 4, 2005 Amateur Radio Newsline report number 1438 with a release date of Friday, March 4th 2005 to follow in 5-4-3-2-1. 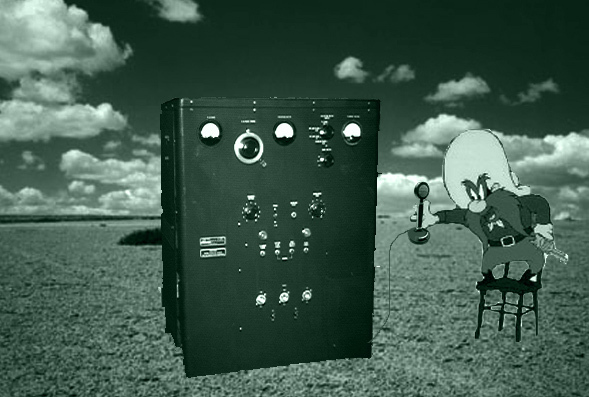 --- Actual interfereing audio: (data buss followed by) "Varmint, I'm agonna blow you to smithereenes..."
-- The interference came on for just a few seconds at intervals of just under 2 minutes. 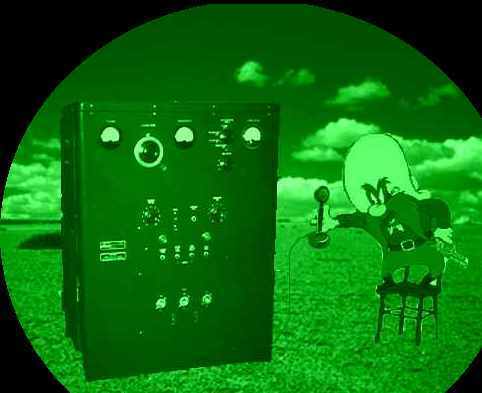 The fact that Yosemite Sam was loud and clear told the Stark and Langer that the interference was intentional and not simply a transmitter gone bizzerk. Using Stark's mobile installation the pair quickly found that the signal grew stronger as they headed West. They then shifted to a Potomac Field Intensity Meter with a shielded loop antenna. Using this gear they located the offending transmitter at the MATIC facility on the Laguna Indian Reservation. MATIC is an acronym for the Mobility Assessment Test and Integration Center. This is a military facility used to develop advanced battlefield communications systems and not generally known to the public. The two hams dove up to the building. At no time did they leave the public highway. Langer began taking pictures of the towers, antennas, and building. Immediately a not-very-friendly guy started walking towards their truck. He was yelling and gesturing for the hams to stop taking pictures and go away. Langer and Stark beat a hasty retreat. Now here's the real kicker. The ham radio T-hunters found the interfering transmitter at about 2:30 in the afternoon. The signal went off the air around 5:30 that evening and has not been heard since. Langer suggests that the origin was a contractor's employee having having a little fun on the radio. Obviously his or her superiors got the message that ham radio operators do not consider interference to their spectrum to be something to enjoy."